I know it's not something new. You can even get the boxed mix from your favorite grocery stores. But not me. I chose to make them from scratch- like I always do. And I added a little twist. I filled some of the balls with pinches of cream cheese in my attempt to keep the red velvet cupcake with cream cheese frosting tradition. The plain ones are okay but I'm a sucker for anything with cream cheese so I prefer adding that little surprise in the middle. Slightly flatten a dough ball and push a pinch of cream cheese to the center before forming it into a ball again. Roll in confectioner's sugar before baking. I'm happy to be able to share my recipes. This is late but I hope your cookies turned out great! Thank you for recipe just made chocolate crinkle cookies definitely trying this weekend. This sounds like an amazing recipe! :) I'm gonna try it tomorrow! But approximately, how many cookies does this make? Thank you! For this you can make 12-18 cookies depending on the size. I had to make them bigger to have room for the cream cheese filling but if you want the cookies plain, then you yield more cookies or just double the recipe. No it won't. Make sure you use pinches of chilled cream cheese and if you noticed, the dough is refrigerated for an hour before they are formed into balls and then straight into the oven. The cookie itself will be soft while still warm and the filling for sure-so you have to let them cool them completely before consumption. Thanks for this recipe. I did not want to besmirch my reputation as a "from scratch" baker and use one of the many recipes online that use a red velvet cake mix. I plan to add white chocolate chips to mine. Merry Christmas! Made these today! We added white chocolate chips and they are amazing! I believe the dough would have been too gooey to add the cream cheese, though, the white chocolate chips worked great! I think next time I will make the dough a day early to try to avoid the gooey factor, let it chill overnight. These cookies are really yummy!! Thanks for the recipe! You are very welcome and I'm glad you liked it. You bet, chilling the dough before making the balls helps. Just make sure the cream cheese is well chilled and firm before using and you'll be fine. made these recipe so many times and i super like it, the only thing is it hardens the 2nd day. though, i store it an airtight container the 2nd day when i take a bite it falls cuz it hardens a little bit, (feels guilty throwing it so i have to eat it). I'm sorry to hear that. I can only suggest that you make sure not to over mix and over bake your cookies; do not make shortcut when softening your butter by microwaving it - do it the natural way; add just a pinch of salt or just skip it totally and lastly, put a slice of white bread in the air tight container where you store your cookies. You can also nuke your cookies for 15 seconds before eating to soften them again.I hope these helps. I made these tonight, LOVED THEM!!!!! Thanks for the recipe! Hi Faye - do you treat the cream cheese in any way, i.e. roll it in sugar or something? Or is the cookie sweet enough that just having the plain cream cheese in the center is okay? And do you form the dough around the cream cheese, or just press it into the bottom? Thanks! Hello! You are correct, the cookie is sweet enough so no need to add sugar to the cream cheese. First, form a ball from the dough then gently press it in the middle to make room for the cream cheese then fold the sides over and form it into a ball again. Make sure your cream cheese is firm because it makes it easier to fill the balls. Thanks Faye! Can't wait to try this. I have my guinea pigs, I mean - taste testers - all set and ready to go! Thank you for a recipe without using a cake mix. I am not a fan of those cookies because I really have no clue what is in them. I'm making these this weekend. Can hardly wait. You're welcome! I hope you can try the recipe soon. No problem! You can just use plain milk or plain yogurt if you don't have buttermilk since you only need two tablespoons. As buttermilk substitute, take out a tablespoon from a cup of milk and replace it with a tablespoon of distilled white vinegar or fresh lemon juice; let it stand for five minutes then you can use it any way you want to. 1. if i don't add the red food coloring, can it pass off as the usual chocolate crinkles? 2. if i add melted chocolate to the batter, do you think it will make it fudgy? 2. I am not sure because I haven't tried it. But if you noticed, I only use two tbsp buttermilk and the result is the consistency that I need and to add more liquid, maybe we should find a way to balance it out so the texture of the cookies is not sacrificed. Hello! Thank you for sharing your experiment :-) I think I have the solution to make the batter less gooey. I remember making sables (butter cookies) in the past with egg yolks only because the whites have more water content in it. So I would suggest that you use the yolks only and that's taking away a little more liquid from the batter as egg whites are 90% water (which makes it healthier actually). And if that still doesn't work- I guess we just have to concede that some things can be done with the best results using specific ingredients. But I do hope this works for you. No problem! Happy baking and keep me posted! Hi! Me and my friends tried your recipe but apparently, we failed. I think because of the oven. Anyway, i have a question. What would you suggest that i add to make the crinkles have that 'melts in your mouth' feel? Cause i have tried buying red velvet crinkles online, theirs was really melting in your mouth but i like your recipe much better cause the cream cheese is inside the ones that they are selling are more of a sandwich-y like crinkles :) can you help me please? Thanks! Aw, I'm sorry to hear that! I'm glad though that you're still curious about how to make it a certain way which means you are not giving up. Anyway, you can try using a mixture of all-purpose flour and corn flour- use 1/2 cup of corn flour or cornstarch with 1 1/2 cup all purpose flour and that should give your cookies that melt-in-your-mouth aspect. Make sure to whisk the two well before adding the rest of your ingredients. I hope that helps and thanks for the compliment. Let me know how it turns out. You're welcome and btw, I'm about to post my "melt in your mouth version" from my little test kitchen. Hi, can I bake this using oven toaster? Thank you!! First, is your toaster oven the heavy duty type? You know the one that is capable to do the task. Then, make your cookies small and bake your cookies in batches, maybe 4 at a time so you can be sure they're cooked through. The smaller they are, the quicker they bake and preheat it first before putting in your cookie dough, Don't stray away while baking so you can keep an eye on your cookies. It has a sign for baking cupcakes also. So it is considered okay? And do I still need the temp in 375 F or i just preheat it? Thank you so much!! Before I tried other recipe with chocolate kisses but its melting and started to burn so i needed to take it out while they are not done cooking. Yes, you should wait at least until it's lit up or the bars have turned red. I would suggest to do 350 and just make your cookies a little smaller to make sure they're cooked through. Good luck! Hello! First, make sure to refrigerate the cookie dough before rolling and the balls are well-coated with sifted powdered sugar before placing in the baking sheet. Also do not touch the balls with damp hands. Hello Jami :-) That is really sad! But guess what, I have migraines every now and then yet I still eat chocolates but in moderation. 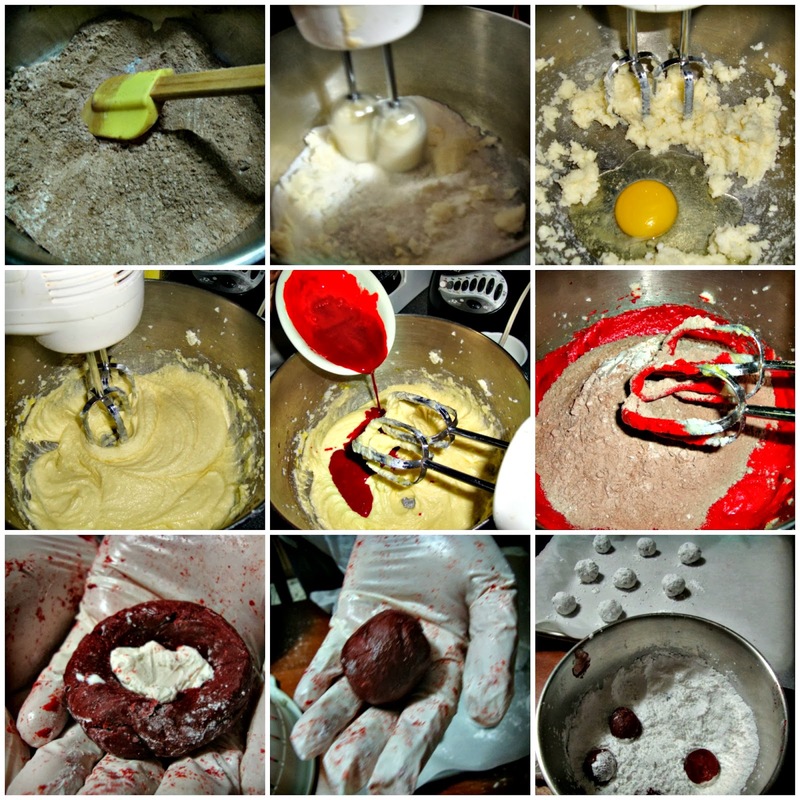 Without the chocolate then you won't have the red velvet taste in your cookies- just the red color. How about baking some for him without the cocoa powder and then some for you with the complete ingredients so you'll taste the real deal?. . I made these today..right texture, divine taste...they are heavenly! soft and chewy and not too sweet perfect for coffee or tea or whatever! i am a sucker for red velvets and this recipe is perfect for keeps!!! <3 i soooo love it! Yay! And I love it more when I hear red velvet success stories- I mean, from my recipe :-) Congrats! And do not over bake them. Remove from the pan and on to the cooling racks as soon as you take them out of the oven. Or you can just use the yolks because egg whites are mostly water which makes the dough soft. For the nice red color, I get my vegetable food coloring from Smart & Final (it's what they call their corporate brand First Street) a few drops go a long long way and it's even cheaper than McCormick. You're very welcome! And I'm sure your cookies turned out perfect. I just wish there's a Smart and Final store in your location so you can get that particular brand. Can you change the dye color? Do you mean the vegetable food color? Definitely! But you have to change some ingredients- like if you use a light color, then use white chocolate instead of cocoa powder. I once made green velvet cake for St. Patrick's and I still used cocoa powder but for pink velvet, definitely white! I hope your cookies turned out great! I would do it at 356 degrees because 396 will be too hot. do you know it this recipe will ship well? I have been shipping cookies to my friends but not these ones. Still, it shouldn't be any different from the ones I do so just take these into consideration if you are planning to: Pack cookies in a sturdy tin or airtight container. Place a sheet of bubble wrap on the bottom of the container then make sure to line each layer of cookies with parchment paper leaving more to cover the top. Then cover with another sheet of bubble wrap before sealing your container. I've tried your recipe and my kids love them... But i had a hard time forming the balls because its so gooey. Its just now that i've read here in the comments that i can use only the yolks. I have a question, can i use brown sugar instead of the white one? Will the taste differ? And can i lessen the sugar? Thanks! 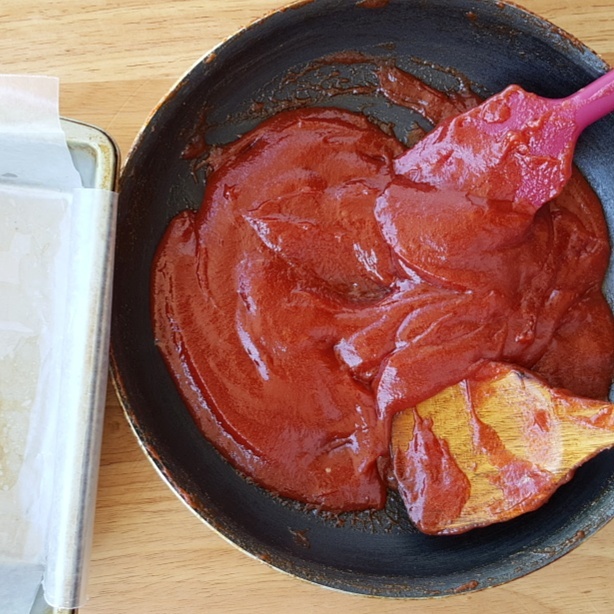 Actually, the cornstarch gives that melt-in-your-mouth effect to the cookies, Please refer to my Melt-in-your-mouth Red Velvet Crinkle recipe.McCormick does work but from what I heard, you need a lot to achieve the color you need. Try it though and I wouldn't use oil because we are trying to minimize the liquid ingredient. I prefer using unsalted butter in baking rather than shortening or margarine because the butter makes the cookies more delectable. There is no taste that you can get from either margarine or shortening although they keep the cookies from spreading out but that can be avoided by chilling your cookie dough before baking and achieve that deliciousness we all aim for.